This ideal-LIVING 2019 Spring Travel Guide challenges you to take a step back and look at the big picture—not just a single place that might intrigue you, but an entire region that’s compact enough to comfortably tour in a week. Within each area, you’ll find popular destinations to explore, festive events to enjoy, and vibrant communities to visit. Your mission is to design a trip that combines a great vacation experience with a journey of discovery to your possible new frontier. And, make sure Ideal-LIVING.com has your e-mail address to receive updates on discovery travel opportunities. An adventure along the Carolina coast can begin on America’s most beautiful barrier islands, include a tour of historic waterfront towns, and conclude at popular oceanfront destinations, with plenty of new residential communities to check out along the way. A series of oceanfront islands with unspoiled beaches and laid-back seaside towns, The Outer Banks of North Carolina feature attractions like the inspiring Wright Brothers Memorial at Kitty Hawk, hang gliding over Jockey Ridge State Park’s gigantic dunes, the North Carolina Aquarium on Roanoke Island, and the Cape Hatteras Lighthouse. You can drive the entire 150-mile stretch, explore the National Seashore at your leisure and linger in oceanfront hamlets, then take the ferry ride from Ocracoke to the mainland. This historic riverfront town in North Carolina’s Inner Banks region features a delightfully walkable downtown with cafes, galleries, antique stores, gardens, and the drug store where Pepsi-Cola was invented. Tryon Palace tours, boating, and kayaking on the surrounding waterways, and hiking on the nearby Croatan National Forest nature trails are among the New Bern area’s most popular activities. Beaufort is the hub of the Crystal Coast area and was named “America’s Coolest Small Town” by Budget Traveler magazine. The North Carolina Maritime Museum is located on the Front Street boardwalk, along with restaurants, bakeries, galleries, and pubs, while water taxis take nature lovers to the wilds of the Rachel Carson Coastal Reserve and the Cape Lookout National Seashore. The historic riverside city of Wilmington and nearby oceanfront towns from Wrightsville Beach to Southport make this area one of North Carolina’s most diverse destinations. Stroll, shop, and dine along the Wilmington Riverwalk, visit the North Carolina Aquarium at Fort Fisher, or tour the battleship North Carolina and the 67-acre Airlie Gardens. Historic sites and interactive museums, scenic cruises and watersports, amusement parks, and day trips to the beach are among the most popular vacation activities. Area accommodations range from downtown Wilmington hotels and inns to beach houses and condos overlooking the ocean. A 60-mile arc of South Carolina oceanfront that stretches from the town of Little River south to Winyah Bay, The Grand Strand includes a dozen distinctive seaside towns with the high-rise hotels and condos of Myrtle Beach right in the middle. Vacation attractions include 100+ shops, restaurants, and entertainment venues each at Barefoot Landing and Broadway at the Beach, and more than 90 championship golf courses that are open for visitor play year-round. For an all-day family adventure, enjoy the outdoor sculptures and nature exhibits at Brookgreen Gardens in the Murrells Inlet-Pawleys Island area. A Wilmington tradition since 1948, this year’s event includes garden and historic home tours, a juried art show and sale, a downtown parade and fireworks display, a street fair with 300+ vendors, musical theater presentations, a shag-dancing contest, and performing artists including 2019 headliner Hank Williams, Jr. The 15th annual celebration of great food and drink in the coastal town of Beaufort will feature wine-themed dinners in restaurants and private homes, a champagne brunch, a fashion-show luncheon, the Grand Reserve tasting and auction, and the signature Vin de Mer Culinary Village with live music. The region’s finest restaurants, wineries, and distillers combine forces to welcome visitors and locals alike to historic Bellamy Mansion with music, art shows, and unique ticketed events like the Southern Smoke BBQ Cocktail Party, the Corks & Forks Grand Tasting Event, and the Bubbles, Brews & Street Eats finale. Take in three days of the best in country music on four stages along the oceanfront Myrtle Beach Boardwalk, with more than 30 performing artists, family-themed events, a Battle of the Bands, and 2019 featured acts that include Alabama and Dierks Bentley. Featuring big-name artists and talented up-and-coming performers for the 22nd year, this summer’s event will feature a sunset blues cruise, nightly shows at The Rusty Nail in Wilmington, NC, a blues workshop, an acoustic blues gathering, a day-long blues jam, and a Saturday night concert finale. Encore at Briar Chapel (Chapel Hill, NC) features single-story residences for age 55+ active adults by David Weekley Homes, with clubhouse activities, racquet courts, and nearly 25 miles of fitness trails in the Research Triangle area near Chapel Hill. Carolina Colours (New Bern, NC) features social and fitness activities at the Pavilion Clubhouse, an on-site golf course, racquet courts, woodland trails, and distinctive neighborhoods with water, wetland, and fairway views. Summerhouse on Everett Bay (Holly Ridge, NC) offers custom-quality homes and flexible floor plans, as well as community amenities like boat docks with Intracoastal Waterway access in a seaside location near Topsail Beach and Surf City. River Bluffs (Wilmington, NC) has with single-family homes and sites on the North Cape Fear River, plus healthy-lifestyle amenities that include a fitness center, hiking trails, kayak launches, and community gardens. Brunswick Forest (Wilmington, NC) is now home to the New Hanover Regional Medical Center in The Villages center. Just minutes from Wilmington, the Cape Fear National Golf Course, tennis/pickleball courts, biking trails, and kayak docks top the list of amenities. Compass Pointe (Wilmington, NC) is a close-knit community of neighbors in southeastern North Carolina that features the award-winning Compass Pointe Golf Club, wellness programs, and social gatherings at The Grand Lanai Amenities Center. The Bluffs on Cape Fear (Wilmington, NC) offers waterfront building sites and custom homes with on-site resort amenities and a beach club on nearby Oak Island. A new fitness center with pickleball courts and the Riverfront Park & Boat Launch to open soon. St. James Plantation (Southport, NC) is located near the seaside town of Southport and has a private Oak Island Beach Club. On-site amenities include an Intracoastal Waterway marina, fitness centers, and member access to four 18-hole golf courses. Palmetto Creek (Bolivia, NC) features single-family residences by preferred builders and a resort clubhouse, tennis courts, kayak launches, and a unique boardwalk trail. The Southport location is just 10 minutes from the beach. McLendon Hills (West End, NC) features a full-service Equestrian Center with a new covered riding arena and nearly 10 miles of bridle trails, plus the region’s best fishing and boating on Lake Troy Douglas in the golf-rich Pinehurst-Southern Pines area. Cresswind Charlotte welcomes residents age 55 and older who appreciate a location that’s convenient to the Uptown area and international airport, with amenities like tennis/pickleball courts, miles of walkways, and numerous interest clubs. Cresswind Myrtle Beach is an active-adult community with homes that have big porches and open floor plans, plus a huge pool complex, sports courts, and fitness facilities in the popular Common Market area near the beach. Logan Homes has been building luxury residences on the Carolina Coast since 1986. Their Build Smart process takes every buyer from design-center consultation and construction-team reports to energy-efficient home satisfaction. Bill Clark Homes is a featured builder in the finest North and South Carolina communities. For more than 40 years, the family-owned company has offered fully customizable floor plans and total peace-of-mind warranties. Once upon a time, retirement communities were built around amenities like golf courses and recreation centers with pools and tennis courts. Social life revolved around the country club or racquet club or other popular activities like boating and gardening. Today’s active-adult communities offer that and so much more. Baby Boomers still play golf and tennis (or, increasingly, pickeball), but we also like some diversity in the things we do and the connections we make. What may have begun coincidentally in some places—“You collect stamps, too?”—has become a proliferation of “interest clubs” that are changing the dynamics of community social life. Large planned communities can have 100 or more active clubs, but every community these days has dozens of groups where you can share your writing, learn to play an instrument or sculpt a vase, enjoy sports and games from kayaking to keno, and give something back by tutoring a student or helping the needy. The bonuses are new social networks created and a quality of life enhanced. “‘Relationships’ is one of the three core Cresswind lifestyle components,” says John Manrique, Vice-President of Marketing for Kolter Homes. “Clubs are a major part of creating, growing, and strengthening personal relationships in our communities.” Kolter began to develop its Cresswind brand for age 55+ homebuyers in 2010, and today there are eight communities in the Carolinas, Georgia, and Florida. While each site was chosen to enhance active-adult options in its area and offers distinctive amenities, all began the planning process in the same place. center for our residents,” says Manrique. “It’s the starting point for each masterplan and then we design the clubhouse itself with a flexibility of space for future uses. Our residents are empowered to create and lead the clubs that they and their neighbors are interested in exploring together. Most have a book club and a cooking club, but we also have clubs for horseback riding, canoeing and kayaking, and even triathlon training. And we’re especially happy when they take the initiative to address a need in the area, so we’ve got clubs that lead food drives, mentor students, build homes, and raise funds for a variety of good causes. For most Cresswind residents, there are no additional dues to pay. “Access to and the full use of all on-site facilities is included with membership in the property owners’ association,” Manrique says, noting that groups like travel clubs set their own budgets for off-site adventures. And while none of the Cresswind communities have their own golf courses, most partner with local clubs that offer access and discounts. Located on Tennessee’s Cumberland Plateau between Knoxville and Nashville, Fairfield Glade is an established community with a 50th-anniversary celebration planned for 2020. It’s also a vacation resort, which means that Fairfield Glade has amenities that include five 18-hole golf courses, a Racquet Club with indoor/outdoor courts for year-round play, and meeting facilities at the Conference Center, which is adjacent to medical services the Wellness Complex. The abundant facilities are an obvious draw, but a half-century of experience has taught Fairfield Glade that interest clubs are the heart and soul of community life. “We have more than 50 different active clubs today,” says Paige, “representing just about everything imaginable. In addition to our golf and racquet clubs, we have groups for fishing, birding, cycling, chess, softball, card games, quilting, kayaking, photography, and writing, to name just a handful. And since all are organized by our residents, new ones are created every year. In addition, we have an events team that plans and manages more than 130 community events every year. Paige also cited an example of a Fairfield Glade interest club that has, literally, branched out into the surrounding area. “Years ago, a group of residents started a ‘Friends of the Trails’ club to promote hiking and trail building within the community,” Paige says. “Today we have more than a dozen great hiking trails in Fairfield Glade, which the club members maintain.” Many Fairfield Glade residents have gone on become “Friends of the Cumberland Trail,” putting their experience and enthusiasm to work in establishing what’s well on its way to becoming a 200-mile Tennessee trail. Compass Pointe is a master planned community on the North Carolina coast near Wilmington that offers residents an impressive amenities package and membership options. The Compass Pointe Golf Club features a centerpiece 18-hole course that opened for play in 2016. Membership also includes access to the nearby 27-hole Magnolia Greens Course. The separate Grand Lanai Amenities Center is open to all, with a recreational lawn out front for bocce ball, a central building with flexible meeting space, a resort-style pool, a new indoor pool and lazy river, tennis/pickleball courts, and a wellness center with fitness facilities. While new members are joining the golf club every month, community clubs that meet at the Grand Lanai are growing, too. “We now have more than 30 active interest clubs at Compass Pointe,” says Marks. “They’re all formed and run by residents. Our tennis club is huge with more than 250 members and our bocce club has 200 participants. We also have clubs for for everything from gardening, bowling, and knitting to card games of all kinds and Bible study. One of our more unique new clubs is ‘Professionals Without Walls’ for residents who work remotely and benefit from the interaction and networking opportunities. Lakewood Ranch, the second best-selling planned community in the nation, turns 25 this year. How did they get here and where are they headed? Travis Allen Hall, born and raised at Lakewood Ranch (LWR) in Sarasota, FL, experiences most palm-tree-lined, 78-degree days as though he’s looking through a colorful kaleidoscope of moments pulled from those sprinkled across a 25-year timeline. Hall’s family was one of the first 25 families to move into Lakewood Ranch. Hall says that during his daily drives along Lakewood Ranch’s bustling Main Street, that years of memories are readily accessible—playing basketball with friends on courts that projected laughter and sound for miles, of riding bikes and playing outside until dark with no sign of people or even houses, and of his first days on the tennis courts shortly after they were laid. 25 years later, Hall’s mother and father live in the same Summerfield house he grew up in, in what would become Lakewood Ranch’s first neighborhood. Hall’s brother, Colby, lives with his family in Greenbrook, also a neighborhood in Lakewood Ranch. But, memories aren’t the only reason they’re all still here. Grand visions of a four-house neighborhood becoming a veritable resort town and the impetus for growth and development of an entire region somehow didn’t seem unlikely to the Halls. But, the speed with which it came did surprise them. “People have always flocked to Sarasota,” Hall says. And, while the development of surrounding rural areas was the inevitable next step in this region in the mid-90s, no other community that cropped up during that time took off as quickly nor grew to the extent that Lakewood Ranch has. By the time Hall was ready for high school, just a few years after they moved in, Lakewood Ranch High School had just opened to 9th graders only. Subsequent grades were added the following year. Hall was enrolled in the first freshman class and graduated from the first graduating class at Lakewood Ranch High School. In the summers, he and friends fished for blue gill and bass in nearby ponds and lakes, spent mornings and evenings on one of a dozen tennis courts and basketball courts, and days in one of many pools. By the time he graduated high school, groceries, and shops had popped up along Main Street. Clydesdale-led parades barreled along the intimate streets lined with Floridian architecture that now wind through Lakewood Ranch Town Center. And, by his 20s, entertainment, shopping, schools, and a bustling business district characterized Lakewood Ranch as a veritable town. And, the return on that investment has been far greater than they dreamed. Lakewood Ranch now has a tennis center complete with 20 har-tru clay courts, six world-class golf courses (plus one under construction), homes ranging from $180k to $10 million, schools for pre-school to college, and 1,500+ businesses, including bio-tech companies, health care facilities, and the area’s top-ranked hospital. Both Travis and his brother still spend portions of their days “investing” in Lakewood Ranch. Colby Hall is the Sports Director for the Lakewood Ranch YMCA, and Travis has been a Lakewood Ranch YMCA tennis coach since he graduated from high school. His parents are settled into retirement, living their best life in the most popular planned community in Florida. “Yeah, they wouldn’t be anywhere else,” Hall says. So, what of this vision? How do you create a vibrant, business-friendly community that attracts retirees as quickly and seamlessly as it attracts young people and families? Yes, it was rooted in palm tree-lined streets, expansive parks, and tight-knit neighborhoods. But, it takes a slightly more expansive vision and innovative thought process to drive this kind of growth—to create whole towns from scratch with such distinct and varied neighborhoods in 25 years. How did Schroeder-Manatee Ranch, LWR’s parent company, seamlessly surpass their goal of creating a self-sustaining, independent community/city now recognized as the second largest and fastest-growing planned community in the country? Multi-generational living is definitely one of the secrets. There are age-targeted neighborhoods within Lakewood Ranch, including Del Webb and soon-to-open Cresswind. And, the allure for residents of each, says Leslie Rothschild, realtor and Live Sarasota co-owner, is that while they have easy access to a larger, multi-generational community, they also have the luxury of being surrounded by neighbors who desire similar lifestyles. Rothschild and her husband chose Del Webb for what she calls its “cult-like” following. “Once you know what it’s like to live in a Del Webb community, you can’t live anywhere else. Seriously, it’s heaven,” she says. 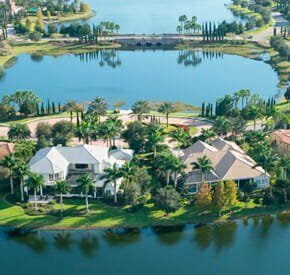 At Lakewood Ranch, Rothschild says, there is a place, a home, an activity, and an overall feeling of well-being for every age and stage, and that’s what makes it so special. People thrive here from every walk of life. Families grow together in a multi-generational environment which creates a vibrancy and security that has become foundational here. Twenty-somethings can buy their first condo or home here, empty nesters settle into the home and lifestyle they want, and seniors can stay close to those they love and receive support from. Rex Jensen, president and CEO of Schroeder Manatee Ranch, the developer of Lakewood Ranch, says that this drives a more innovative approach to development. “This is a community with multiple dimensions and a good share of that springs from these multiple generations and their contribution to our lifestyle,” Jensen says. Another key component of LWR’s success is that Jensen and his team have always incorporated preserving LWR’s roots into their mission. Once a ranch, always a ranch, and while developed, preservation has been integral to the LWR’s design. In fact, 40 percent of the land is set aside for nature and recreation. Rothschild says that there is as much if not more undeveloped land on LWR’s 50 square miles as developed land. Aside from miles of bike paths, natural trails, and endless parks, the Ranch is still just that. And, then, there’s business. With thriving businesses comes growth and an overall sense of security. And, the fact that LWR is home to 1500+ successful companies is a clear sign that LWR has it all figured out. But how? One of LWR’s favorite business models is to “create it and they will come,” trusting that the right person or company will appear. The Premier Sports Campus and the Sarasota Polo Club are both great examples of this. LWR engineered, designed, and built both, then subsequently sold each. This method has been key to LWR job growth and economy building. Patricia (Pat) Collins, born and raised in the Canadian Rockies near Alberta, Canada, and her husband Mark, born in Britain, have been watching Lakewood Ranch since its Grand Opening in 1995. They moved to Atlanta, GA, in the early 90s for work. And, while Pat says she’s tickled to be where she is now, that she left her home in Canada kicking and screaming. “I truly loved where we lived,” she says. While she learned to love or at least like wherever she was, luckily for her, either good fate or a happy accident brought her to the blissful state she lives in now. They continued to visit the Ranch through the years and were fortunate enough to watch it grow into the vision that the founders laid out in the early days. And, 20 years later, give or take, when it was time to retire, Lakewood Ranch decidedly became their destination. After five years in, she says, she’s still pinching herself. They’re involved with groups that go kayaking, biking, running, and of course, partying. “We’re kind of known for finding any excuse to throw a party around here,” she says with a laugh. And, what’s not to celebrate? “We always say we’ll never miss the shoveling, scraping, or shivering. Overall, she said, you have to work pretty hard to have a bad day at Lakewood Ranch. Charlene and Bob Schmitt have seen it all at Lakewood Ranch. Not only were they one of the first 50 families, but their daughter, Kirsten Schmitt, was the first to be born in Lakewood Ranch. “And, not too long ago, our son-in-law bought her engagement ring right here at Vanessa’s Fine Jewelry on Lakewood Ranch Main Street,” Charlene points out, with a noted fondness in her voice. “We have everything we could possibly need or want here,” she says. Aside from all the amenities that made raising children so much more carefree and enjoyable- fitness centers, pools, the YMCS, the Lakewood Ranch Hospital, the movie theatre, and town center—now, in retirement, the Schmitt’s are as active and involved as ever. Among Charlene’s favorite activities are polo matches. Don and Faye Downing, also among the first 50 families at Lakewood Ranch, say that they, too, are in it for the long haul. “You really can’t find another place like this,” says Don. Retirement has been good to them, and he says golf has been the key for him. He works with the First Tee program in the Sarasota area, and plays at least twice a week. “Golf days are definitely my favorite days,” he says. LWR’s newest village, Waterside in Sarasota County, will feature over 5,000 homes in 12 walkable neighborhoods connected via water taxis and trails to a vibrant, lakefront town center—Waterside Place. Waterside is being built around seven lakes, with more than 20 miles of shoreline, acres of nature preserves, and an 8-acre waterfront park, which will be home to concerts, festivals, and farmers markets. Waterside Place, the village center, with an estimated completion date of 2020, will include apartments, restaurants, retail shops, professional offices, and the Players Centre for Performing Arts, all within walking distance of every residence. “Yeah, there’s always something new coming up at Lakewood Ranch. It’s pretty amazing to watch how quickly it grows and adapts, even after all these years,” Hall says. And, so it goes. Families and retirees flock to Lakewood Ranch for a more ideal way of life. And, generations and family trees later, they’re still there. And, you may have noticed that the once coveted property tax deduction has changed. The Tax Cuts and Jobs Act of 2018 lowered tax rates and increased the standard deductions across the board, but it also placed a $10,000 limit on deductions for State And Local Taxes (otherwise known as SALT taxes). The SALT deduction has been a part of our tax code since 1913 and has cost the federal government trillions of dollars in lost revenue opportunities. As these deductions were most favorable to those with incomes above $100,000, the federal government decided to make some changes. The standard deduction for singles has been raised to $12,000 and for married filing jointly to $24,000. In order to claim a SALT deduction, you must itemize your deductions. Consequently, only about five percent of taxpayers are expected to itemize their deductions as opposed to 30 percent in past years. The new regulations are particularly challenging for those who will itemize their deduction and have high income taxes, high property taxes, or both. And, if you itemize, you can deduct property taxes AND state and local income taxes OR you can deduct property taxes AND sales taxes. But, you cannot deduct state and local income taxes in addition to sales tax. Here’s an example. Let’s say you live in New York where the average SALT deduction was more than $21,000 a year, you would only be able to deduct $10,000. This adversely effects those living in areas with high state income taxes and high property taxes. So, if you live in areas like New York, New Jersey, or California, you might want to consider relocating to lower taxed states to save some money. The tax savings alone could be used to fuel your new lifestyle. And, for some other good news, the mortgage interest deduction survived. So if you buy a new home, you can deduct the mortgage interest up to $750,000. You could have a win-win-win scenario by relocating—a new life in an energy-efficient home in a great community, a deduction for mortgage interest, and lower taxes.